The hot summer months are a great time to hit the mountains, especially the Smoky Mountains. And even though it will be crowded, visiting Great Smoky Mountains National Park is a fun way to cool off from urban life on the East Coast. First, let’s set the scene. Great Smoky Mountains National Park is located at a particularly scenic corner of eastern Tennessee and western North Carolina in the eastern U.S. The park is home to an abundance of waterfalls, dense forests, prolific wildflowers and the remnants of Appalachian mountain culture. 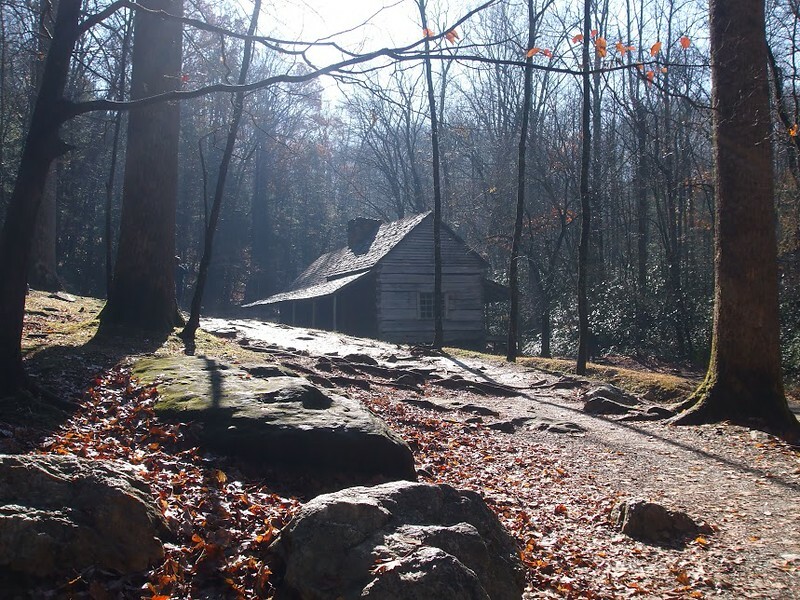 Guest writer, Vera Marie Badertscher from A Traveler’s Library, takes us on Smoky Mountain adventures that are sure to inspire your next trip to Tennessee and North Carolina. Get ready for some boomer fun as you hike, visit historical sites and drive scenic trails in the most visited national park in America. A green cathedral of trees arch over the narrow road that twists and turns, following the wagon paths used by early settlers on the Roaring Fork Motor Nature Trail. 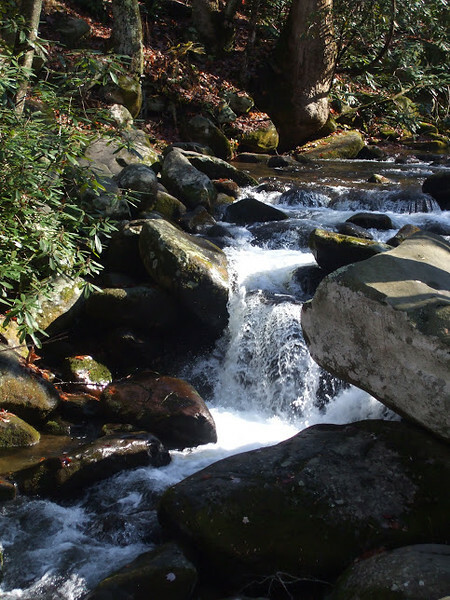 A convenient 5 1/2 mile loop drive that starts in busy Gatlinburg gives a taste of the beauty and history of the Great Smoky Mountains National Park. This drive is perfect if you are limited for time, or looking for some interesting short hikes. You can also hike several trails from the road. As you drive, you’ll pass right by a lovely waterfall, cross a bridge over a picturesque creek and have an opportunity to view how the mountain families lived. Homes vary from log cabin to an artfully crafted home decorated in bright colors. Mostly I marveled at how they packed a family of eleven in two small rooms. Pick up a guide book to the Roaring Fork Auto Tour for full enjoyment. You can purchase guides to this drive and the other two trips I mention below for one dollar each when you visit any of the Visitor’s Centers. Gatlinburg has numbered traffic lights along the main street­­, which leads to the park. Turn at stoplight #8 for this tour. Note: You will not be able to take this road between November and May 1, because of winter weather. Find hotels in Great Smoky Mountains here! Or do what we do—rent a cabin! Unlike the many parks created in Western States on land that was sparsely occupied and had never been broken by a plow, much of the land protected by the Great Smoky Mountain National Park was privately owned. 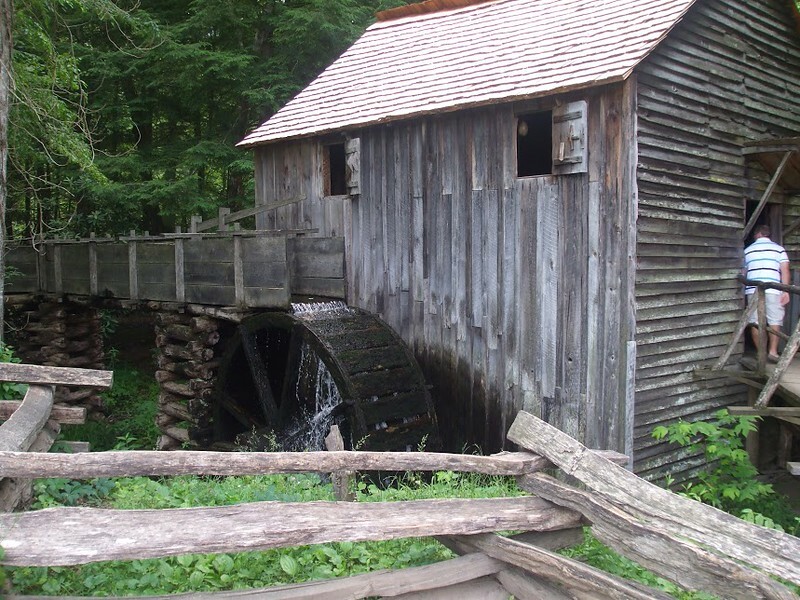 This gave the National Park Service a unique opportunity to preserve and present the history of early settlers in the Smoky Mountains at Cades Cove. On an 11­-mile loop drive to and through the far ­flung community, you will see rough wood cabins and more craftsman-like small homes and churches staking out their small patch of clearing in the woods. The Historic Mill in the mountain village, although a recreation, really brings you back to another time. Your main destination is a historic area where the Park Service has recreated a mountain village, including a mill and unique cantilevered barns. I bought an edible souvenir at the visitor’s center—­­a sack of cornmeal that was ground by the ancient mill wheels. You’ll want to get out frequently and walk around the cabins and definitely take the walking trail through the historic area. Picnic grounds are available near the entrance to the loop drive. If you follow the main park road all the way from Gatlinsburg, Tennessee, the western entrance to the park, you will end at Cherokee, North Carolina, the eastern entrance, passing through Newfound Gap. From the Gap, a side road leads to 6, 634­ ft. elevation Clingmans Dome for a challenging short hike that yields some great views. 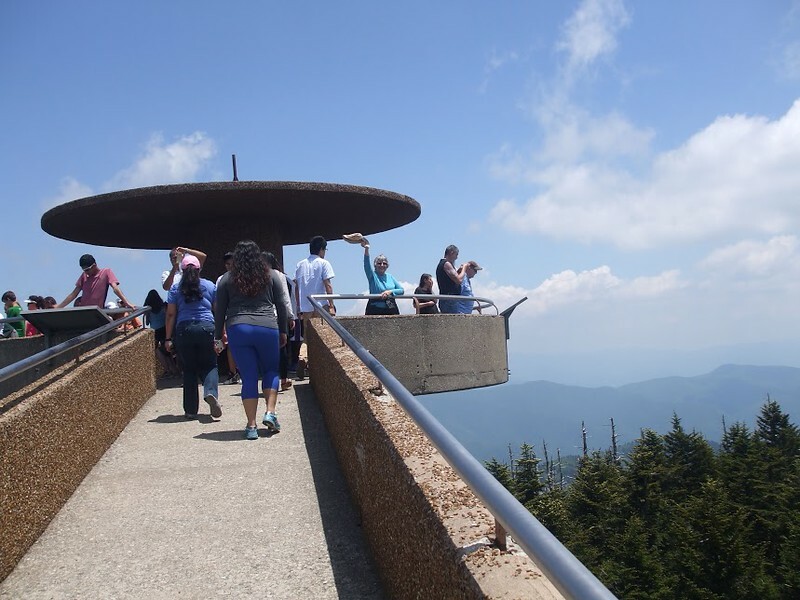 In 1941, President Franklin Delano Roosevelt stood at the highest pass at Newfound Gap ­­where Tennessee meets North Carolina­­ and celebrated the new park. 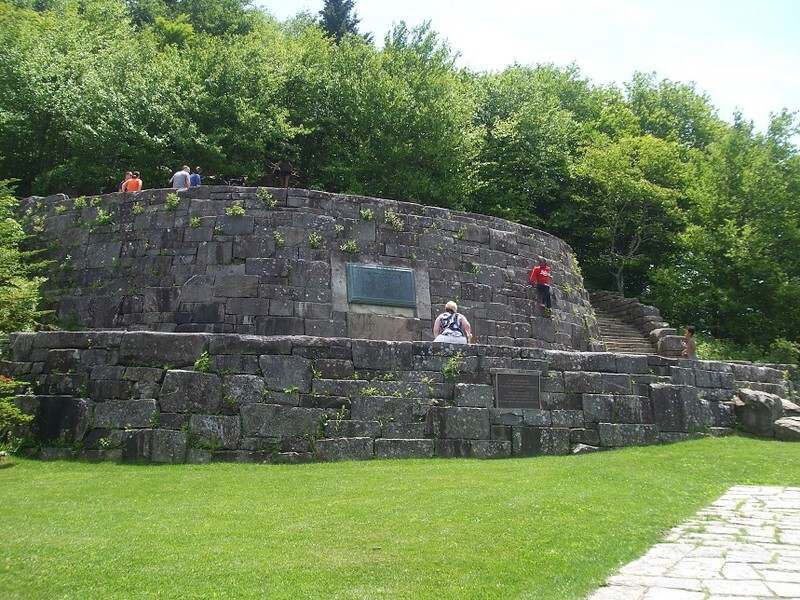 The fancy stone platform made for Roosevelt’s dedication visit is still here. And since the Appalachian Trail passes through here, my husband, Ken, and I saw some scruffy looking hikers taking a break and using the very welcome public restrooms. Rockefeller Memorial, where President Franklin D. Roosevelt formally dedicated the park in 1940. We circled the parking lot several times waiting for a spot to open up and skipped the long lines at the restroom. The small park gift shop carries bottled water­­ and trust me, you’re going to want water with you. I wanted to also pick up an energy bar or some gorp for the climb, but the good news/bad news was they had only chocolate bars. Fortified for the climb, we headed up the sloping, paved trail. FINALLY, the path leveled out at the top and I broke out the chocolate to celebrate. Then we looked up. A spiraling walk led up to the observation deck. More climbing. But I made it. From the top, I soaked in a five­-state misty-blue mountain view that stretched from nearby Newfound Gap to Mount Pisgah, 43 miles away along the Blue Ridge Parkway. After all this drama about the difficulty of the hike, I should confess that it is only 1/2 mile to the top on a paved path. However, it is a 400′ elevation gain, and panting along the path, that feels like straight up. Lest you think I’m just a wimp, I saw normally energetic 10­-year­-old boys who were whining that they wanted to quit . For more ways to explore the Great Smoky Mountains National Park by car, see this guide on the NPS website. Planning a National Park trip? Start with our National Park Travel Planner to get your travels off on the right foot. Looking for more things to do near the Smoky Mountains? Keep on driving to Asheville, North Carolina to visit the Biltmore House. Turn north on the Blue Ridge Parkway for the drive into Virginia and six amazing hikes in Shenandoah National Park that boomers can do. Vera Marie Badertscher is a freelance writer whose love of books and travel led to A Traveler's Library where she reviews books, movies and other things that tempt you to travel and enhance your travel experience.